Seaspeak is a controlled natural language (CNL) based on English, designed to facilitate communication between ships whose captains' native tongues differ. It has now been formalised as Standard Marine Communication Phrases (SMCP). While generally based on the English language, seaspeak has a very small vocabulary, and will incorporate foreign words where English does not have a suitable word. There are other similar special-purpose CNLs, including aviation English for aircraft, and the English–French hybrid PoliceSpeak for safety administration of the Channel Tunnel. 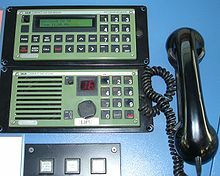 A VHF set and a VHF channel 70 DSC set, the DSC on top. 2 Example phrase "Say again"
Seaspeak originated at the International Maritime Lecturers Association (IMLA) Workshop on Maritime English in 1985 in La Spezia (WOME 3), in a project led by Captain Fred Weeks, and was updated in the following years. After the M/S Scandinavian Star disaster in 1990, in which communication errors played a part, an effort was made by the International Maritime Organization to update Seaspeak and the Standard Maritime Communication Vocabulary (SMCV). This resulted in the development of the Standard Marine Communication Phrases (SMCP), which were adopted by the IMO as resolution A.198(22) in November 2001 at their 22nd Assembly. Could not hear what you said, please repeat! I did not understand, say that again. Too much noise, repeat what you said! I am having difficulty hearing what you are saying! Please repeat what you were trying to say. There is too much noise on the line - I cannot understand you. A simplified vocabulary also helps overcome static, since the phrase "say again" is always two words and three syllables, no matter how much it is blurred by that static. Strevens, Peter (1984). Seaspeak Reference Manual. Pergamon Press. ISBN 0-08-031056-7. Weeks, Fred; Alan Glover; Edward Johnson; Peter Strevens (1988). Seaspeak Training Manual: Essential English for International Maritime Use. Language Teaching Methodology Series. Pergamon Press. ISBN 0-08-031555-0. IMO Standard Marine Communication Phrases (SMCP). International Maritime Organisation. ISBN 92-801-5137-1. Prolingua, the company where Edward Johnson worked on SeaSpeak, AirSpeak, etc. This page was last edited on 21 July 2017, at 17:54 (UTC).